These salmon slices are one meal that is listed on the exquisite menu at the dining table at the Rifflin Hitch Lodge in Southern Labrador. 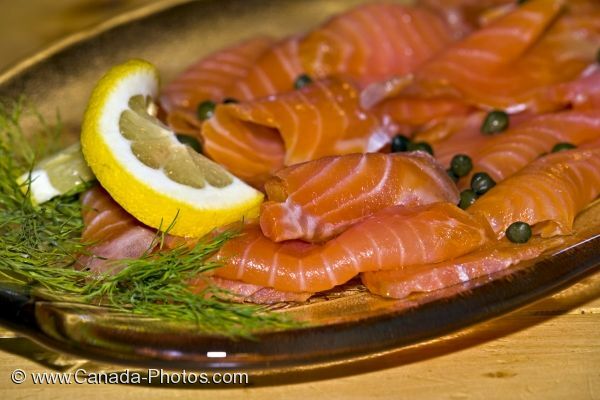 A platter of salmon slices at the Rifflin' Hitch Lodge that are served at the dining table where all guests can sit down together, enjoy a meal and get acquainted. Fishing is exceptional in the waters around Rifflin Hitch Lodge in Southern Labrador and when you see a meal of salmon slices such as this, you're taste buds are already soaring before you even get a bite of these delectable meals. Salmon Slices laid out on a platter at the Rifflin'Hitch Lodge in Southern Labrador, Labrador, Canada. Picture of salmon slices displayed as a delicious meal at the table in the Rifflin Hitch Lodge in Southern Labrador.